Several buses transporting undocumented immigrants to a Border Patrol station In Murrieta, Calif., Tuesday were turned back after angry protestors blocked the road to their intended destination. 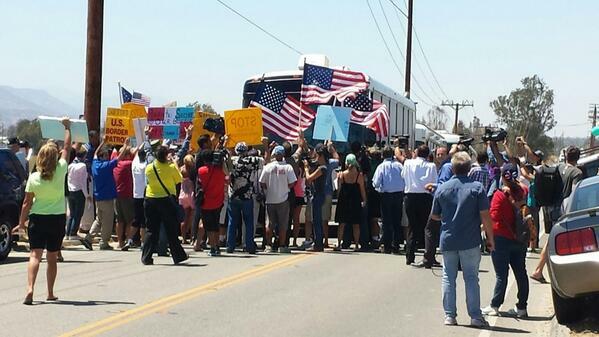 Photographs posted on social media by local reporters show dozens of protestors surrounded the buses heading to a new processing facility set up by U.S. Customs and Border Protection at the Murrieta station to deal with an influx of migrants from Central America. The protestors were carrying American flags and signs with messages such as “Return to sender” and “Bus illegal children to the White House.” Others called on Border Patrol to protect the border instead of look over detained migrants. The federal government previously set up temporary processing facilities in Nogales, Ariz., to supplement overwhelmed facilities in South Texas. Plans to transport 500 undocumented immigrants to the Murrieta facility were pared down after residents expressed discontent and Mayor Alan Long complained that the federal government’s plan would put a strain on the city’s resources. Upon arrival the buses carrying 140 undocumented migrants Tuesday turned around for unknown reasons and drove to the Chula Vista Border Patrol facility in San Diego County, a local news station reported.